There's something that needs to be addressed in everyone's life. It's more of an ongoing thing beacuse it's always out there but the way we let it affect ourselves and our lives is crucial. I'm talking about negativity. Negativity is an icky negative energy that comes out in a person's attitude, actions, words, or thoughts. You may not think this post applies to you and maybe it doesn't...but maybe it does! It's important to be self aware of how we come off to other people. If you have a negative energy and you vent about something to someone, that negative energy can be absorbed by them (unless they are great at not letting it affect them). [ ] How you let things affect you - When you get cut off on traffic do you get over it in a minute or do you stew about it for an hour, and then tell your coworkers about how pissed off it made you? [ ] How you talk to those around you - Are you constantly complaining or pointing out negative things? [ ] How you respond to things around you - If someone is having a bad day, do you let it bother you personally? [ ] Physically - people that hold on to negativity tend to have a cold look on their face, tend to get more wrinkles, and tend to be more tense. They also can have an unhealthy weight or physical ailments because "everything just seems to go wrong" for them. [ ] Emotionally - When a person is overcome with negative energy it's all they can do . 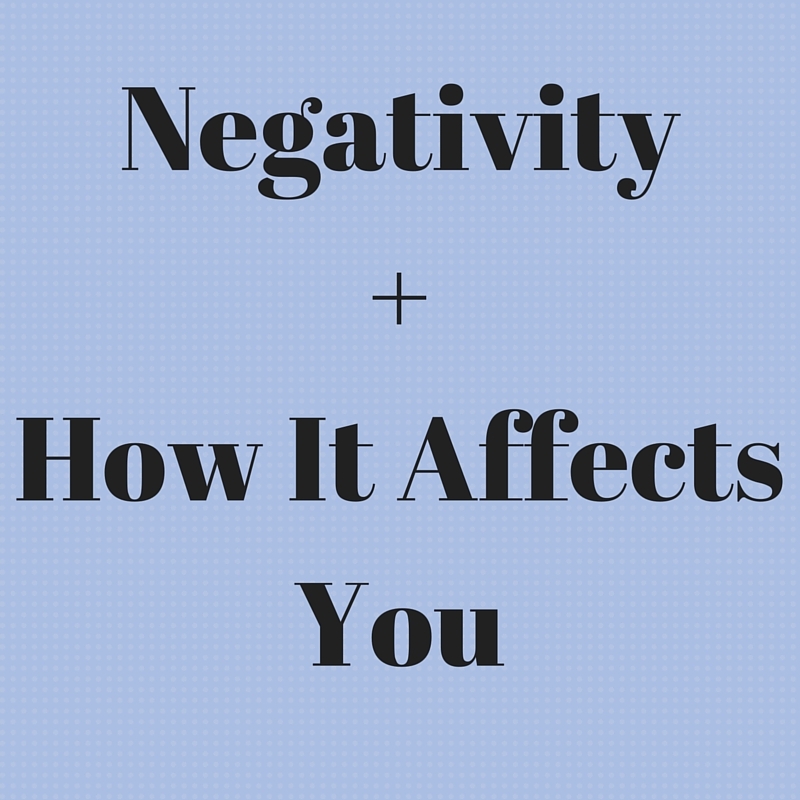 Think negative, speak negative, and feel negative. [ ] Mentally - When the brain is used to negative thoughts it becomes easier to think negatively instead of positively. [ ] Don't let other people's "stuff" get you so worked up. Who cares if you have a coworker that dresses funny. Is it personally ruining your day? Well, it shouldn't be. [ ] Don't complain about every little thing in your life. If you forgot to run an errand, gained a pound, or didn't sleep well you don't need to rehash it with a friend or coworker. All it does is make them annoyed and it's kind of foolish. You never know what someone else is dealing with so ask yourself if your complaint is even worth saying out loud. 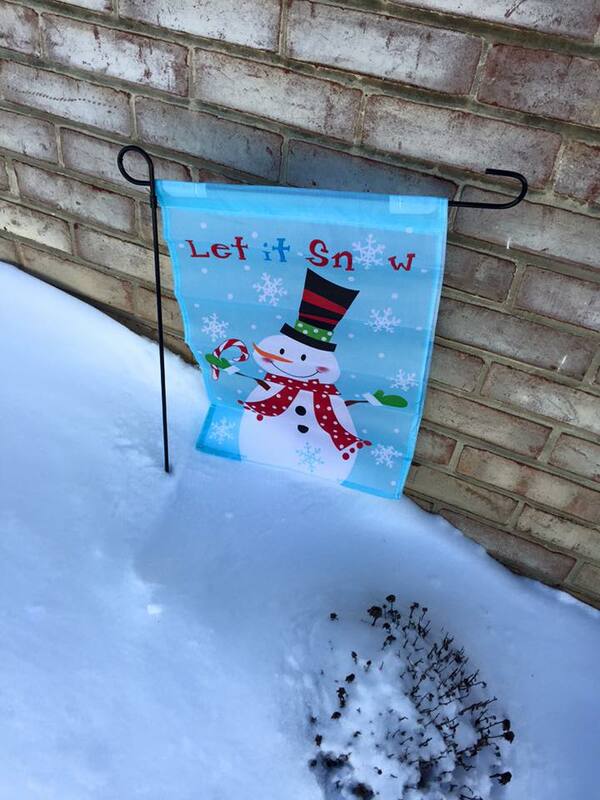 If it's not, let it go! [ ] Take action. If you really can't stand something, fix it. Address the issue with the person that bothers you, change your habits so you are on time instead of constantly late and in a rush. With Valentine's Day around the corner I wanted to show myself some love since I've been working so hard on our new home. So I decided to finish the gallery wall in the office and have my boyfriend help me hang everything. 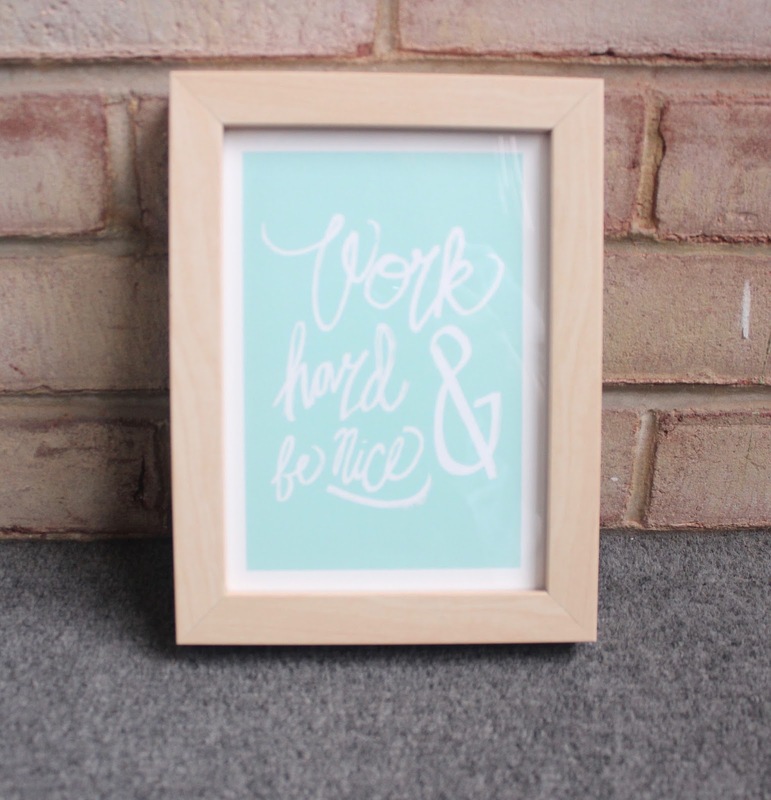 I found some gorgeous art prints on Minted.com! 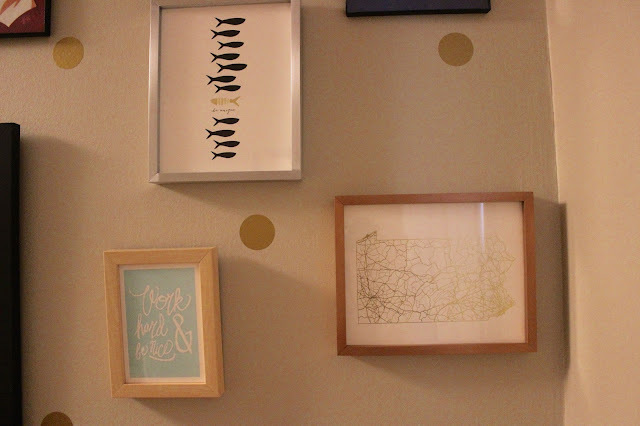 Art prints from Minted.com are available in a variety of designs by a variety of designers. You can even choose a frame so that when they get delivered to your door you can open them and hang them right away! 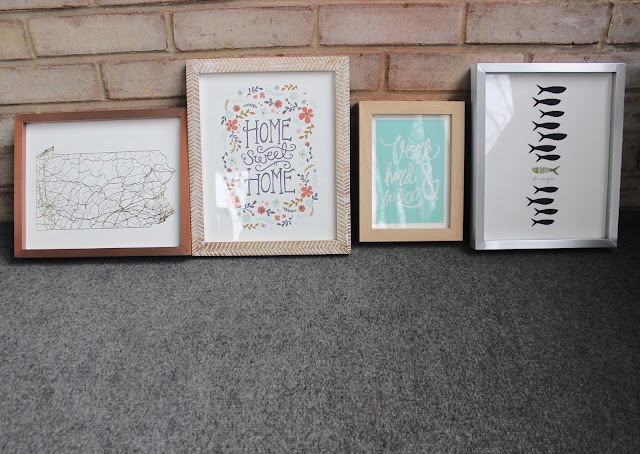 Art prints are a simple yet classy way to decorate your home. 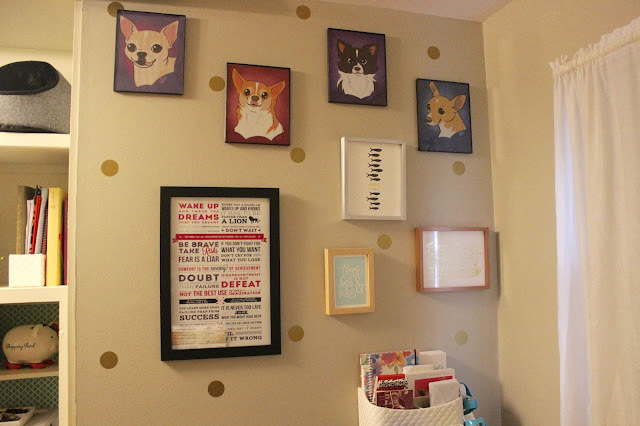 And art prints on a gallery wall add a lot of excitement just to one area. These are the 4 art prints I chose. I wanted to find ones that reflected my own life and things I want to see everyday as I work in the office. This Pennsylvania Map is perfect because I have lived in Pennsylvania my entire life and I don't plan to leave. 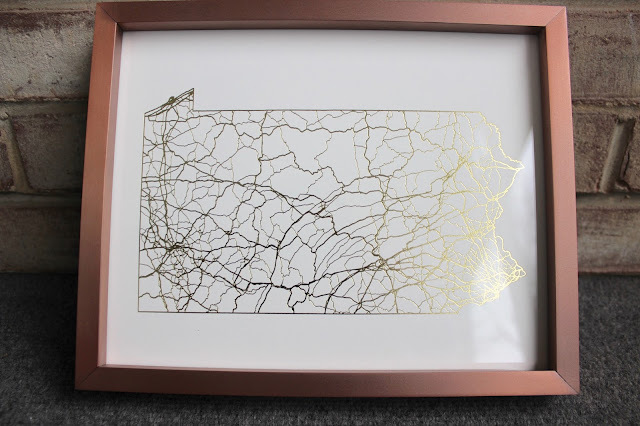 I thought the frame was perfect to give it a more architectural look, if that makes sense. This Unique Fishy print is a favorite of mine. It represents my favorite thing to say which is "It's okay to be different." I always go against the grain and sometimes I feel like I'm the only who does that but obviously I'm not because even this little fish is going the opposite direction! 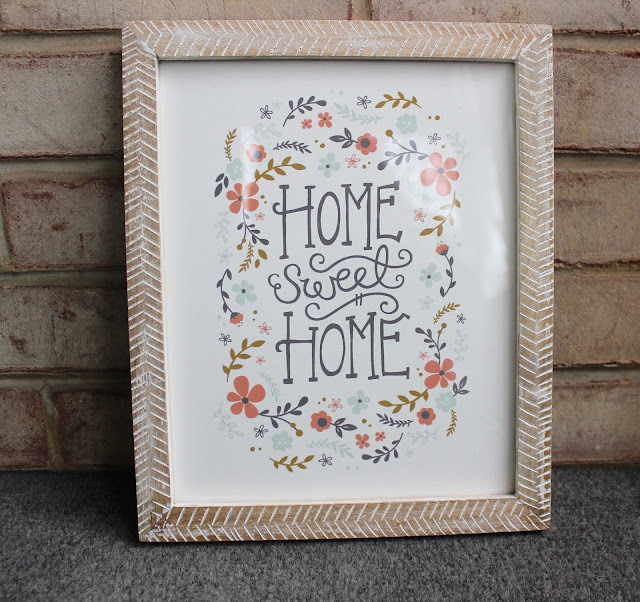 This Home Sweet Home print represents my love for our new house. I love this house and I treat it with so much care and attention that it has to know how much it means to me! This print is a great reminder for me to Work Hard & Be Nice to people. Plain and simple. 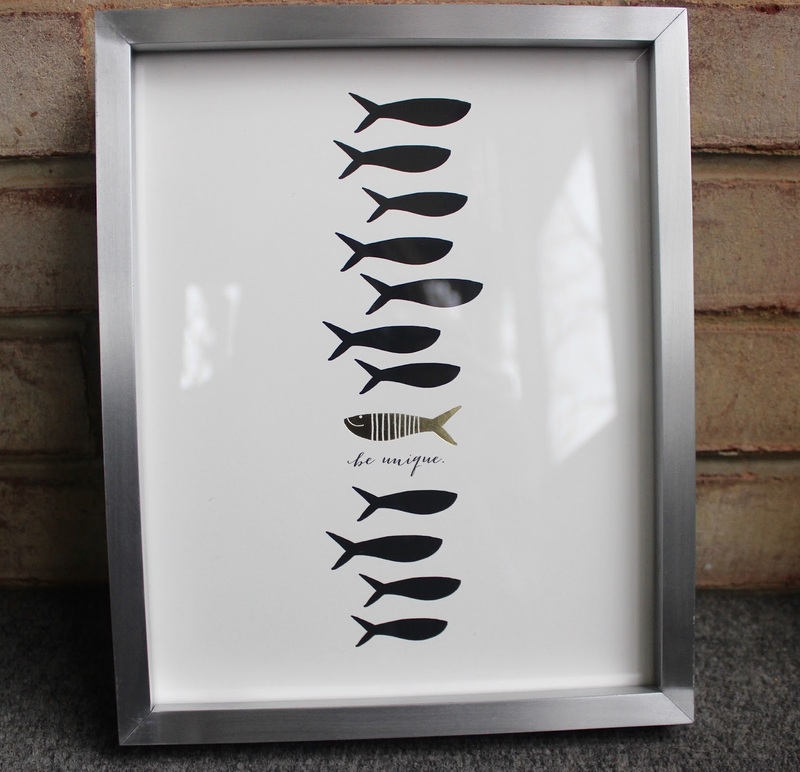 I ordered these in different sizes which is the best thing to do for a gallery wall. They look really cool when you stagger them. 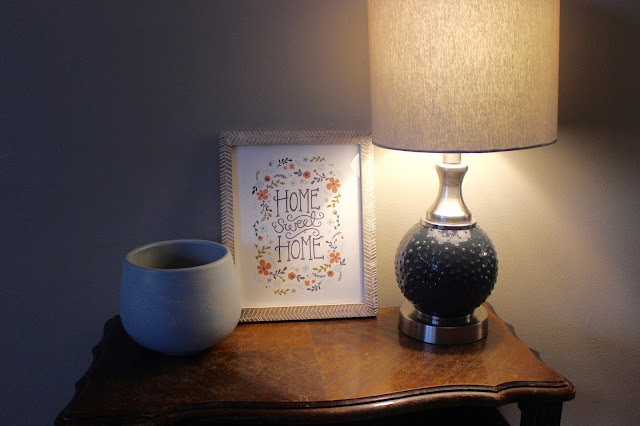 I ended up displaying the Home Sweet Home print right in the entryway as reminder that this IS my home sweet home. Now I have a great offer for you guys - you can win $250 from Minted to spend on art prints for YOUR home. Don't neglect your home with empty walls - show it some love! To enter the giveaway visit this link. As soon as I entered Dr. Augello's facility I was greated by some of the most friendly women I've ever met. Everyone was dressed so professionally and they were so sweet and kind. I immediately felt comfortable even though I wasn't what to expect. I was taken to an empty office where I watched an introductory video by Dr. Augello about his weight loss program and some of his other offerings. After the video was done I got to meet with Dr. Augello himself! He was very nice and explained the whole program, all the options, and hwo it works. 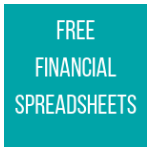 So let's take a closer look at what's offered, what I got to look into, and what you can take advantage of. //Customized Weight Loss Programs. So many people jump on the bandwagon of fad diets and unhealthy means to lose weight. If you aren't doing it the correct way it won't last. At Dr. Augello's office they use a testing system to determine what's keeping YOU from losing weight. Then they customize a weight loss program just for you with specifics for your body type and your own goals. They have different programs like Candida Weight Loss, Hormone Balancing, and Sugar Handling. With the proper program you can have increased energy, lower cholesterol, better digestion, a clearer head and skin, and obviously lose weight! //Infrared Sauna. The coolest thing I've seen lately is their Infrared Sauna. It uses an infrared band of light that your body perceives as heat. 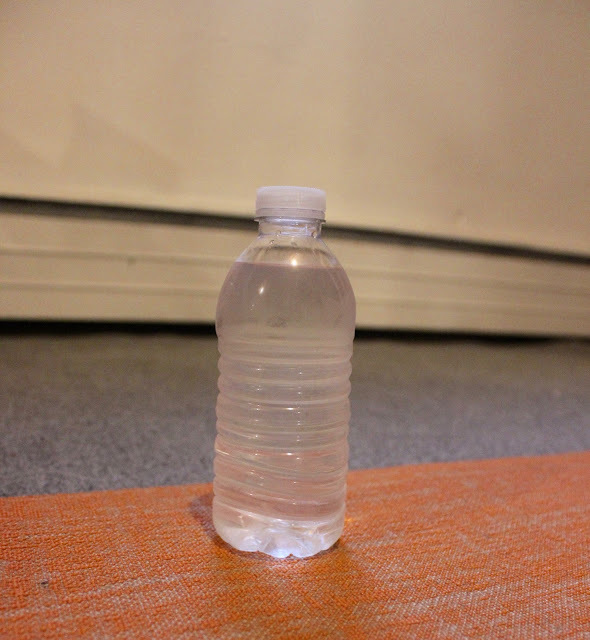 This makes your body expend energy to cool down and produce sweat. You can sweat 1000 grams or more in one session which is equal to running 6-9 miles. Obviously you gain some weight back from rehydrating but the sweat helps release built up toxins. I actually got to try out their Infrared Sauna for 20 minutes. Not only was it super relaxing but it felt great to sweat out my toxins and I felt like a new woman afterwards. //Body Wraps. With these body wraps for weight loss you can lose 4" to 14" in an hour. The wrap process encourages circulatory and lymphatic flow which causes HEALTHY inch loss through internal cleansing. I can't even begin to describe how amazing this was. I got a body wrap for about 40 minutes. It was really comfortable actually. They put on this cream that smelled amazing and then the girl wrapped me up in medical grade wrap and I got to lay in a recliner. Then she put on an amazing self mastery program (I'll get to that below) and I basically took a nap for 40 minutes. My body was so relaxed. After 40 minutes was up she cut the wrap off. I actually felt firmer in every area I was wrapped. //Self Mastery Technology. The power of the mind, I'm tellin' ya! Basically you put on these awesome things called ZenFrames that use a synchronized pulse of light and sound to relax you and allow optimum brainwave activity for learning, focus, and memory. While I was doing my wrap I got to put these on and I fell asleep but as I did I was hearing what the voices in the headphones were saying, basically instilling good healthy habits in my brain. I'm telling you when I woke up I not only felt energized but I noticed I've been making better choices, some of which I remember hearing in the tape they played. //Neuropathy Treatment. This facility has a way to assist people suffering from Neuropathy which is a degenerative condition of the nervous system. It can be very painful and Dr. Augello's facility uses innovative treatments to increase circulation and blood flow and accelerate the healing reversal or symptoms. If you suffer from Neuropathy you should contact his office today to see what they can do for you! 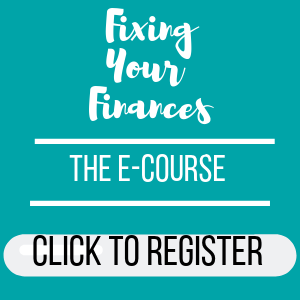 Everyone in the office that day seemed to have nothing but great things to say about the results they had and the lifestyle changes they went through and have adapated to. 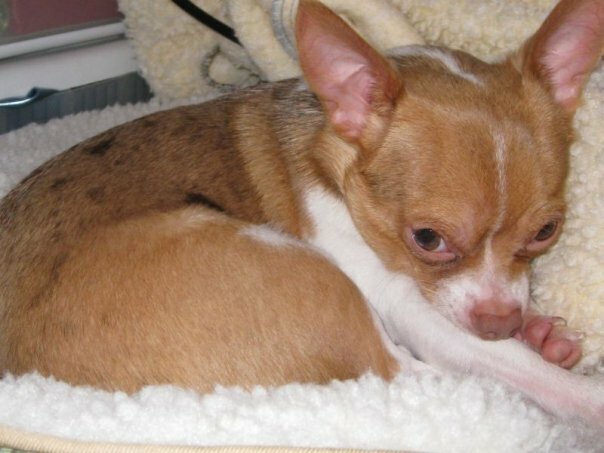 Chihuahuas seem to be low maintenance dogs to most people but just like any pet, you need to care for them even if it means letting a professional do it. When it comes to grooming, bigger breeds often go to the groomer but I like to do everything myself. So, here is how I groom my babies! 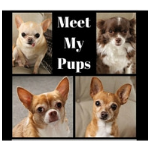 Even though 3 of my chihuahuas have short hair, they shed like crazy, even more so than Stella (my long hair). So I take them outside every 2 weeks and I use the Furminator to brush them really well. The Furminator is amazing and not only gets the loose hair from their undercoat but it literally will give you enough fur to make another dog. Brushing not only helps my dogs feel better but it keeps my home less furry and I have less vaccuum and dusting upkeep. I brush each of my dogs teeth twice a week. I use a little finger brush and some doggy toothpaste and I do my best to get a glob on the brush and push it around inside their mouths. You don't have to brush the same way you do for people. As long as the toothpaste is in their mouth it can do it's work. It's very important to take care of your dog's teeth as oral health is directly connected to heart health. 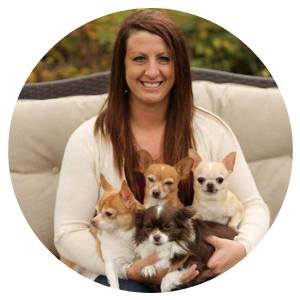 The thing with chihuahuas is that they are susceptible to both heart and oral problems so this is even more important for someone like me. For chihuahuas, the majority of grease and oils on their fur comes from humans touching them, but since my pups aren't around a ton of people, I only bathe them once every 2 months. I use a gentle soap and do one dog at a time. Sometimes it requires me blow drying them when we're done. Usually Stella is the only one that needs a trim since she's my long hair pup. The little tufts of fur in between her paw pads can get really long and then dirt sticks to them and I know it bugs her because I see her licking them. So once a month I will take some shears and trim those hairs as well as the wisps of hair around her neck and face. If those get too long they can get matted and it drives her (and me) nuts. It's important to remember to reward your dog anytime you (or a professional) grooms it. I like to use Blue Buffalo Savory Sizzlers from Chewy. They really give my dogs a nice treat they can chew up for a few minutes. It's a great way to let them know they did a great job putting up with the poking, prodding, snipping, and clipping. Do you groom your dog or do you leave it to a professional? That's right - Tropical Storm Jonas did some major damage to Harrisburg, Pennsylvania. 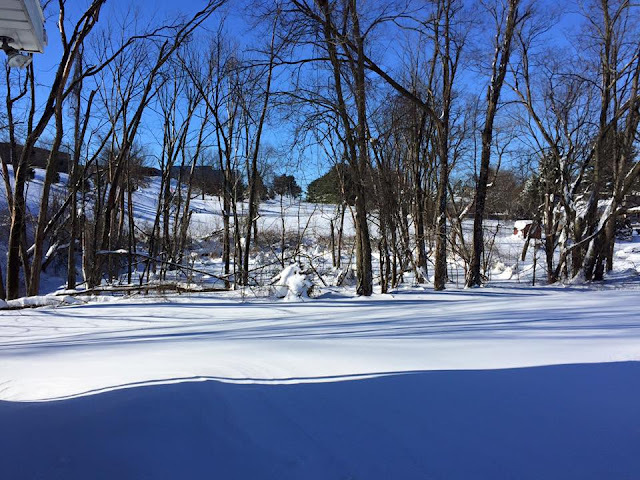 It snowed steadily from 4 pm Friday till about 5 pm on Saturday. I couldn't believe how much snow fell. Ironically, this was our first snow in our new house. 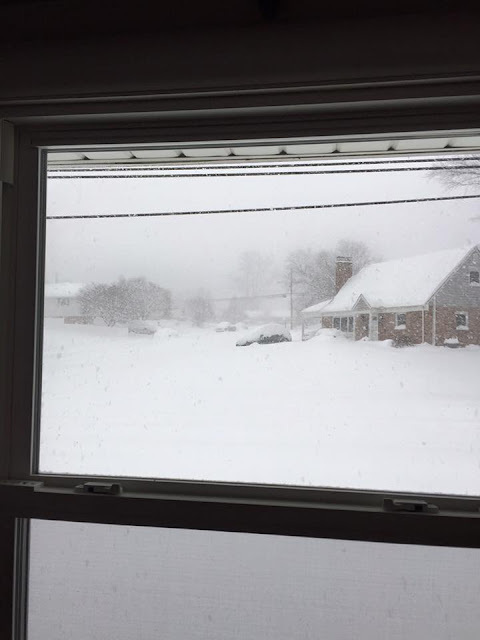 Go figure it's a blizzard! 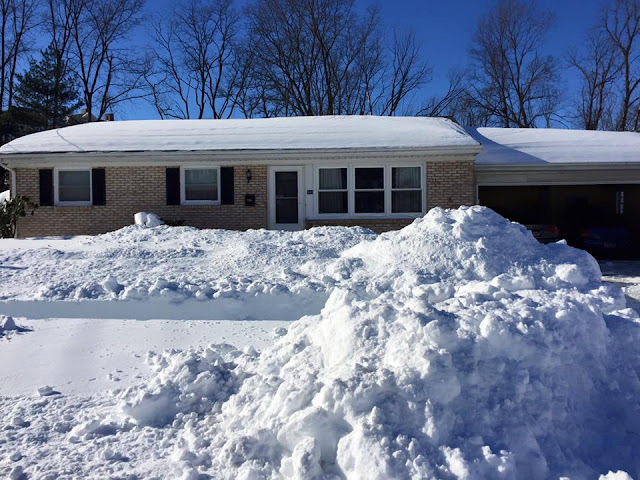 The grand total was 30.5"! Crazy! Oh and how did my dogs fare? Well, they use pee pads inside so it wasn't that big of a deal. Still, Grace was not impressed. 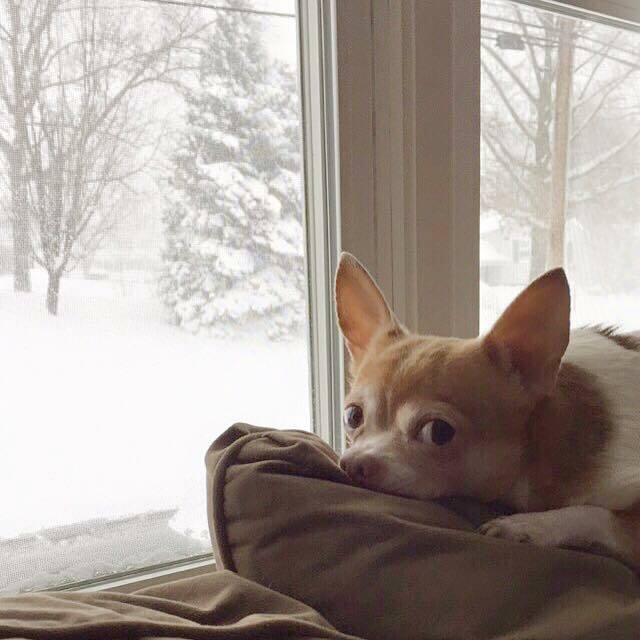 Winter time gets me into such a lazy rut. I stop caring about physical activity, good nutrition, and good habits. Really, there's no excuse for that because it's all a matter of making little changes so that the big picture is a healthier, happier lifestyle for myself. I know that it's important for me to stick to a fitness routine and make healthier choices when I'm not working out so that I don't totally throw myself off balance. So without further ado, here are some small but positive changes I've made so far to help me stay on track with my fitness goals. And in case I didn't grab your full attention yet, maybe the above sweepstakes will! 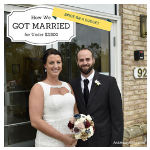 The goodnessknows® sweepstakes runs for 3 weeks starting January 18th and you can enter to win one of two $500 gift cards up for grabs each week with a photo or quote! Instead of teas, sodas, or juices I've been keeping water handy all during the day. Often when you think you're hungry, you're just thirsty and when I didn't have water nearby before I'd reach for food which would fill me up and make me too tired to stay active. I used to think that stretching was only necessary after a workout but that's not the case. Stretching helps relax me and force me to slow down for a few minutes. It also makes me feel energized in the middle of a long day when I'm stuck in paperwork at my desk. 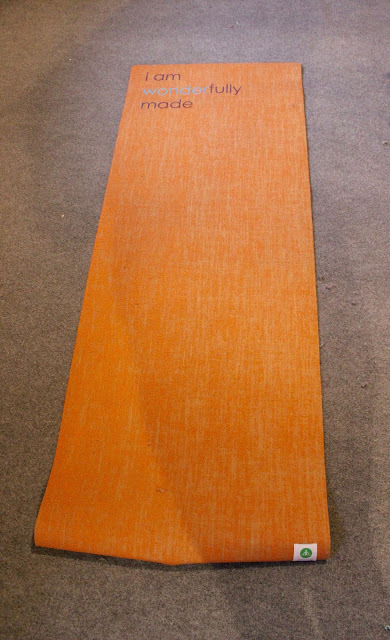 I also take time every night to stretch on my yoga mat for a few minutes. When I'm on the go and out running errands I tend to expend a lot of energy so it's only natural that I feel hungry. If I would try to ignore that feeling I would end up feeling starved and stop at a fast food joint to get a very unhealthy meal. It's okay to let yourself have a break and enjoy a snack so there's no point in starving yourself! Now, I let myself munch on goodnessknows® snack squares, which I purchase at Walmart. These snack squares come in 3 varieties that I consume at different times. 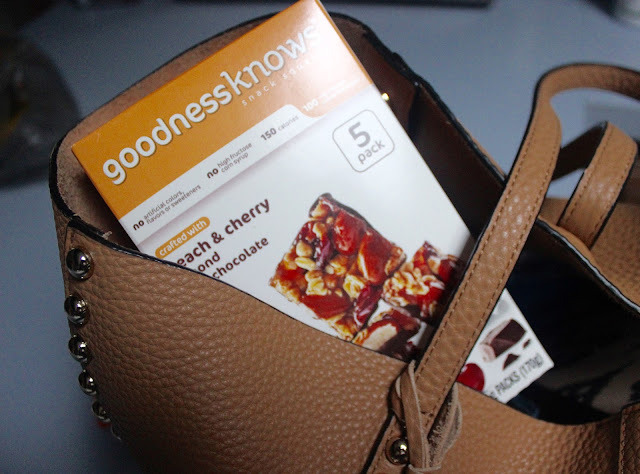 goodnessknows® Peach & Cherry, Almond, Dark Chocolate snack squares are delicious when I'm on the go running errands because it satisfies my sweet tooth with the fruity taste! 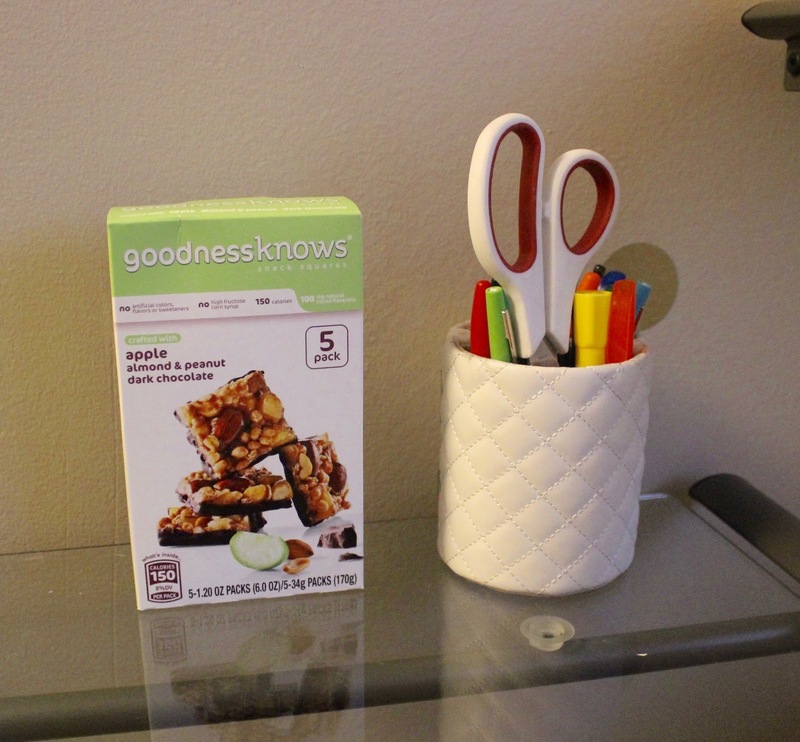 goodnessknows® Apple, Almond & Peanut, Dark Chocolate snack squares are my work snack. I enjoy snacking on fruity things when I blog so this really hits the spot. 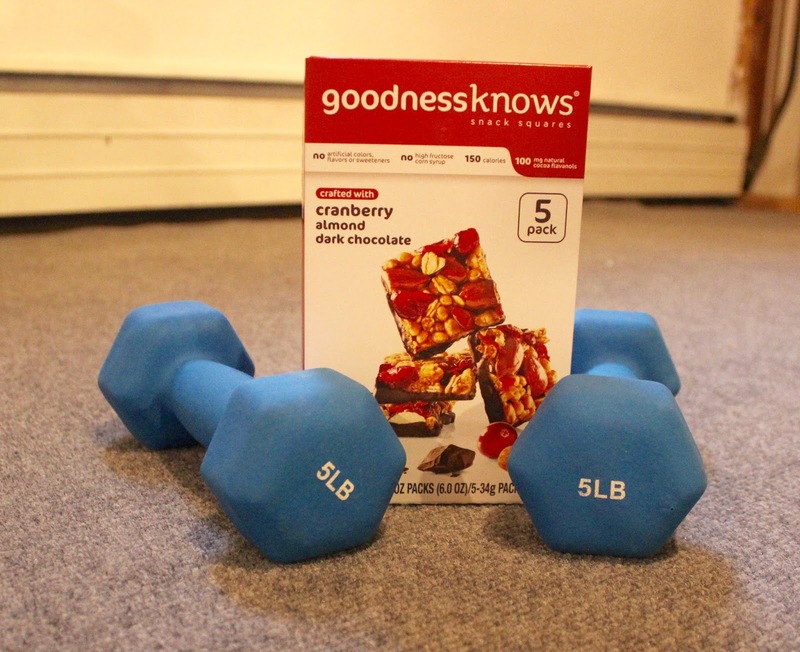 goodnessknows® Cranberry Almond, Dark Chocolate snack squares are my go-to snack before my workouts. I feel satisfied and ready to move after I eat them. This variety is definitely my favorite! 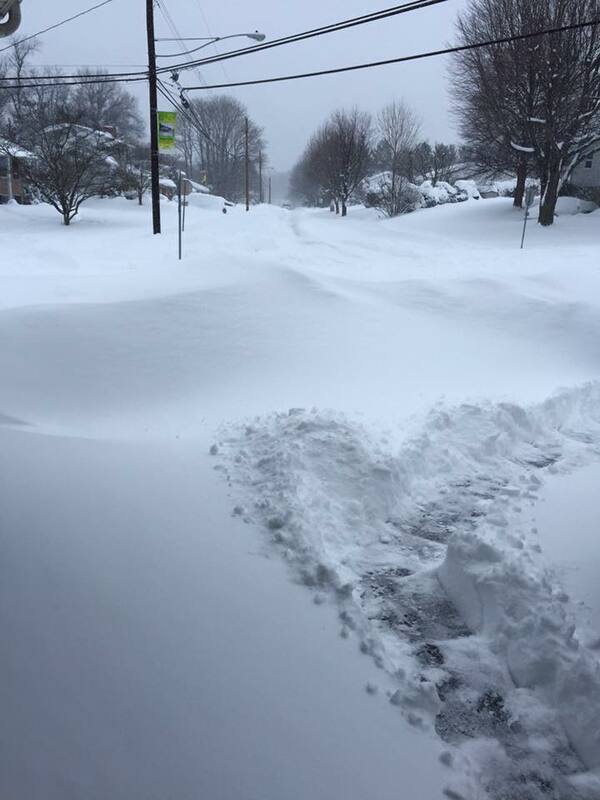 Running was always a way for me to get moving a few times each week but now that it's winter and the weather is cold I try to make excuses that I can't go outside so there's no way I can work out. This is soooo not the case. We actually have a gym in the basement of our home. I can't even use having to drive to a gym as an excuse to not work out. So I decided to stop making excuses and instead start making a winter fitness routine which I will share for you below. 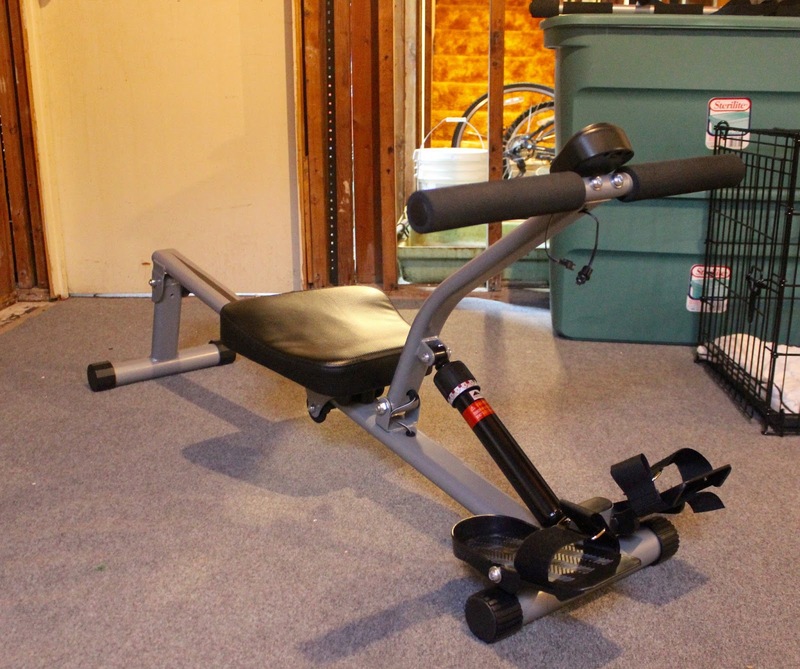 My rowing machine has several different tension settings but I keep it on level 5 because it still gives me a workout but it leaves me with enough energy to do a few other exercises afterwards. I usually listen to music or watch a movie on the TV in the gym. Rowing gets my heart pumping and works out my core as well as my legs. If you don't have a rowing machine you can use a treadmill or another type of fitness equipment. After I'm done rowing I do 50 pushups. I usually take a brief 30 second break when I get to 25. I also use these little things that are supposed to help you keep your form properly when you use them to do pushups. After my pushups I lay on a yoga mat and do 100 bicycle crunches. By the time I get to 50 I'm screaming so I take a quick 60 second break before doing the remaining 50. The final exercise I do is 25 bicep curls with a 5 pound weight in each arm. Don't forget to stretch your muscles out after you're done so you aren't too stiff and sore the next day! 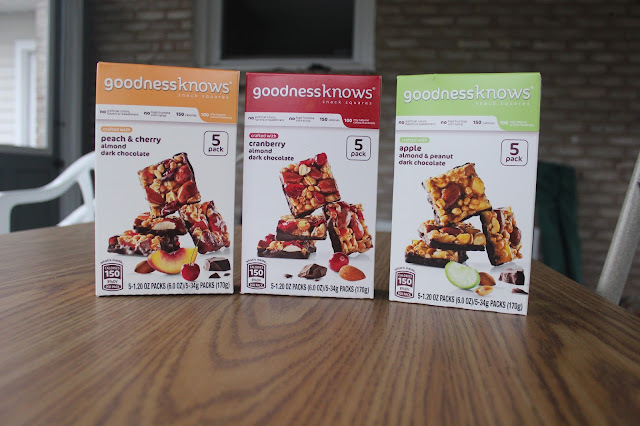 Like I said above, you can find goodnessknows® snack squares in your local Walmart. 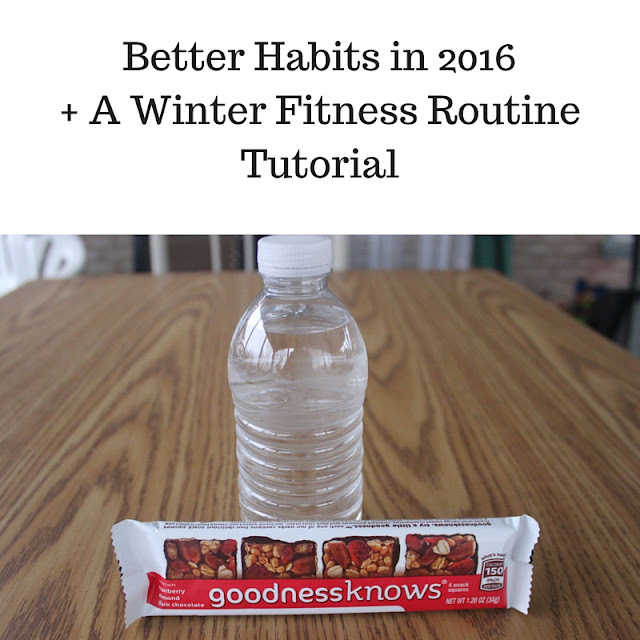 So tell me - what small changes are you making this year? I've written before about different articles of clothing to wear when you want to conceal carry (responsibly) but this takes the cake. One of my favorite brands - UnderTech UnderCover now has women's concealment leggings! UnderTech UnderCover has always had great concealment clothing but with these leggings you get comfort, great fit, and convenience. These leggings feature two holsters (one in front and one in back) that allow you to choose which one you want to use. Our preference can change depending on the activity we are doing so it's great to have options. Each holster has a retention strap that helps secure a handgun and make it quickly accessible if it's needed. You can even store your phone in one of the pockets. I couldn't believe how comfortable these were. They are perfect for running errands or just lounging around. They are the perfect mid-calf length and they even look great if you dress them out for a night out with your girlfriends. You can get them in right hand or left hand design and they have sizes from XS to XXXL. I just can't get over how cute these are. The next time I go to the shooting range I'm wearing these! Ladies - make sure you check these out! They are only $79.99 which is a great deal! Let me just tell you that Farro is delicious and once you try it in this dish, you will look forward to it in many recipes to come! 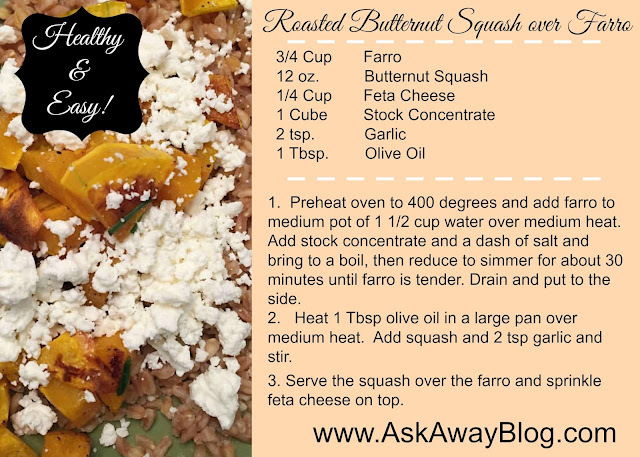 Click here for the Roasted Butternut Squash over Farro Printable Recipe. 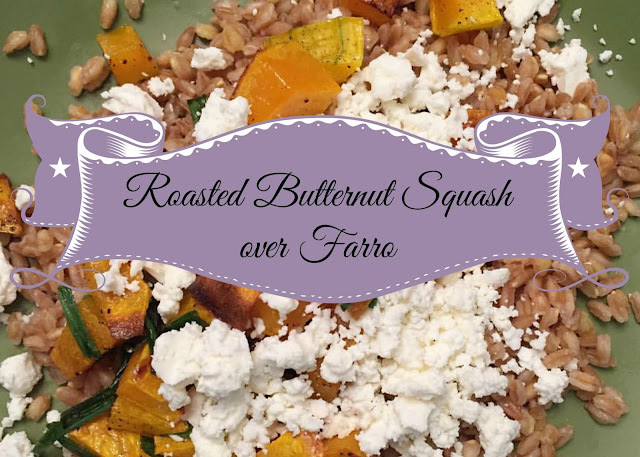 Have you ever cooked with Farro before? What do you serve it with? So if you haven't heard about the KonMari Method than you need to read these posts and buy the book. Or just do some googling. But basically it's a method developed by Marie Kondo to tidy your life and home and keep ONLY what brings you joy. It's been a year since I completed this method and once you complete it you never have to go through it again in it's entirety. As long as you maintain that lifestyle you are golden. So here is how my life is post KonMari. When I walk into my house at the end of a long day of work, I see nothing but open spaces, clear surfaces, and a neat and tidy home. It makes me SO happy and I never feel stressed. Just looking at a cluttered corner can induce a stressful vibe for most people so the fact that I don't have to feel that way is very liberating. 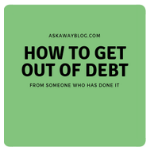 I no longer have to worry about spending money I didn't need to spend. I can see everything I own easily, so I no longer accidentally buy duplicates of things. 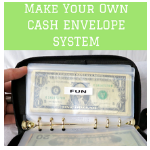 You'd be surprised how much money you spend on duplicates over the course of a year. 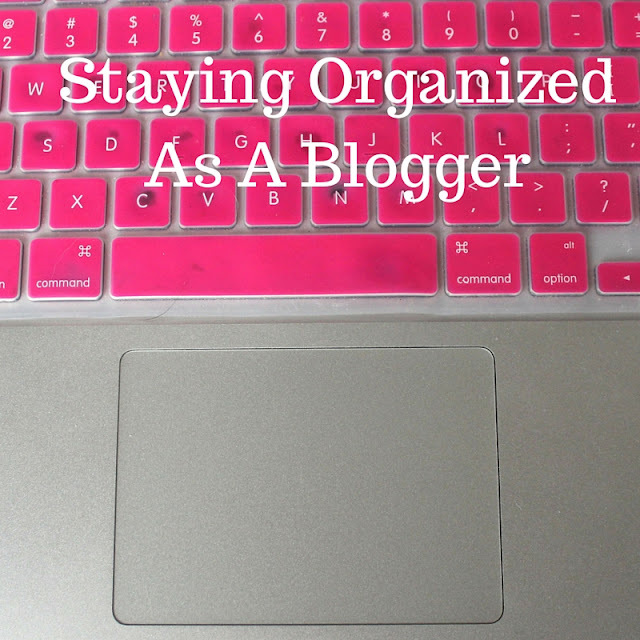 Since I don't have to spend time looking for something (I know exactly where every item I own is), spend time decluttering or organizing, or spend time unloading a cluttered closet just to get to one tiny item, I have more time. I have to make a small amount of time free each week to vaccuum, clean counters, dust, and do a load of laundry but that's it. I feel energized because I have control of my life, my time, my money, and my posessions. I don't spend my energy organizing, decluttering, sorting, or searching. You'd think having less clothing means you would have less options on what to wear but not for me. You see, now that everything I own in my closet is something that I will wear, it's easy for me to grab something and put together an outfit, even if I'm pressed for time. I have to push less hangers around because I don't have things in my closet that are taking up space and never being worn. It's SO easy to have guests over, even for the holidays now. All I have to do is disinfect the counters/surfaces and vaccum. No more hiding or trying to sort through random piles. No more trying to make my house look clean and uncluttered, because it already is! When I'm sick, I barely fall behind in my daily routine. I just clean the house (vaccuum, scrub floors, etc.) once a week so it's not like stuff starts piling up on my to do list if I'm down for the count for a couple days. I fill my free time with things that bring me joy so when I'm not doing one of those things (coloring, watching movies, etc.) I can just relax. This helps me be less stressed, less tense, and more in tune with my body and my surroundings. I literally have at least 1/2 an hour each day where I could just lay in silence on the floor if I wanted to. This is by far the part of my life where I've seen the most changes since I completed the KonMari Method. I meal plan every week so it's easy to make a list of ingredients I need for the upcoming week, it's easy to open the fridge or cupboard to see if an ingredient is already in there, and it's easy for me to get in and out of the grocery store while sticking to my list and not buying things I don't need. When I'm at a store, I no longer buy stuff I don't need. I might see something I love and pick it up and then I ask myself, is this going to spark joy in my home? If it doesn't have a spot, or likely won't spark more joy than what I already have then I put it back. I end up window shopping now when I go to stores and not even purchasing a single thing. When someone shows me something on sale, I don't buy it unless I absolutely need it or it sparks joy. I highly recommend buying the book I mentioned above, and allowing your life to become completely transformed. Have you used the KonMari Method? How has it impacted your life since then? 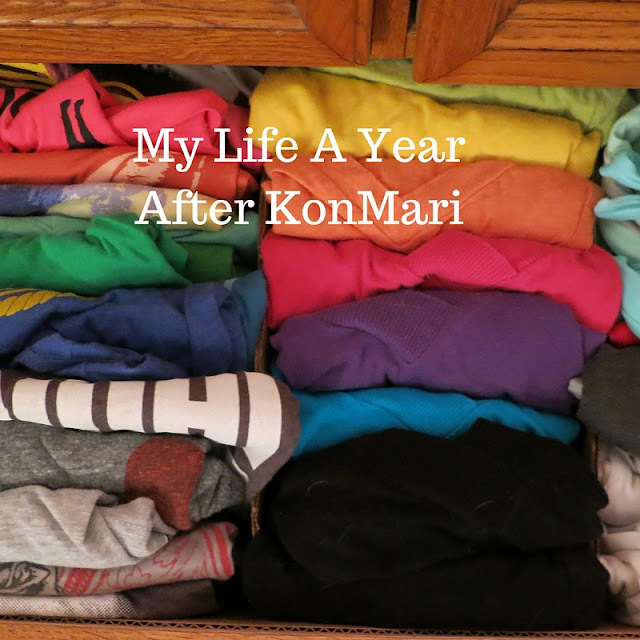 Since so many people that read this blog have enjoyed my posts about the Konmari Method of tidying and asked about the second book by Marie Kondo, I figured I'd post a review about it. 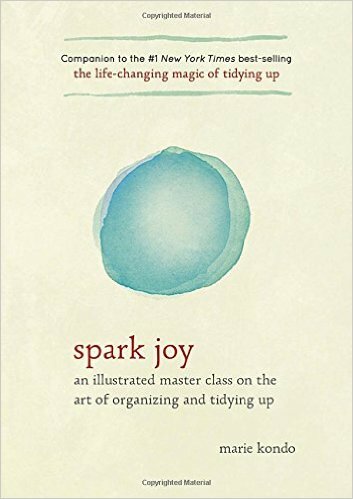 Spark Joy is the second book by Marie Kondo and is a follow up to the original book "The Life-Changing Method of Tidying Up". I'm assuming you've read her first book so I won't really recap it because you shouldn't be reading the second without reading the first and you certainly shouldn't be Konmari-ing if you haven't read the first book! 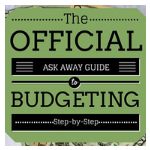 Trust me when I say that the way the book has you do everything is the BEST way. Anyways, I really loved Spark Joy more so than the first book by Marie. Spark Joy is the ideal follow up to the first book. I feel like Marie somehow saw everyone's questions about the first one and answered them all in this one. The entire first 2/3rds of the book are easy to read because she includes picture diagrams on how to fold and organize things. Spark Joy further explains how to tackle every category to find what sparks joy and even explains the number one question - what if an item isn't necessarily joyful but is necessary to keep and use? I absolutely loved the folding instructions for clothing that were broken down by specific category - from underwear to jeans! I actually went through all of my clothing again and refolded everything the proper way. It's now second nature. Marie Kondo also goes into more detail about the different categories of Komono (items besides clothing, books, and papers) and also includes information about Konmari-ing with a kid. The last sections of the book cover how to live life post-Konmari. I tend to be someone that skims over unneccessary chapters in a book and while I almost skimmed some chapters in the first book (the ones about her personal life) I found that there was much less of that in Spark Joy and only at the end did she really explain anything about her own life. So my rating - 5 Stars!!!! And let it be known that you will be SUPER MOTIVATED after you finish this book. If you haven't read either book - buy both and read them back to back. If you've read the first one and Konmari'd already - buy the second one, read it, and watch how it makes you go back to a few categories on your own. If you've read the first one but haven't Konmari'd yet - buy and read the second one ASAP before starting! This book made me redo everything but it only took 2 days since I actually did a great job the first time around. And now, I am sharing photos of my entire home and life with every aspect that was touched by Konmari magic. You can find the photos on my Instagram, Twitter, and my Facebook! Eventually I'll upload them all to a blog post tour as well.